Hip Baby Blog: It's just around the corner! 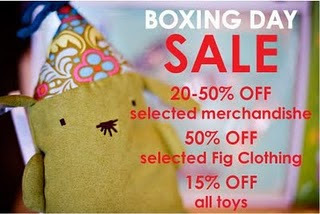 Another reminder to all our customers to take advantage of our first annual Boxing Day Sale. We would love nothing more than to see everyone receive great deals on clothing, toys, bedding, etc. We will have extra staff on hand to assist you in making informed choices and speeding you through the check out as quickly as possible. Boxing Day can be hectic so we'll try and make it as easy as possible for you. Join us December 26th from 9am to 5pm and save up to 50% on selected merchandise. All of us at Hip Baby, wish for you and yours a most happy and safe Holiday Season.